The How Weird Street Faire is an outdoor street fair held each year in San Francisco, occupying several blocks of Howard Street and the surrounding area, in the SoMa neighborhood. The event has been held yearly since 2000, and is currently centered at the intersection of Howard and Second Streets. 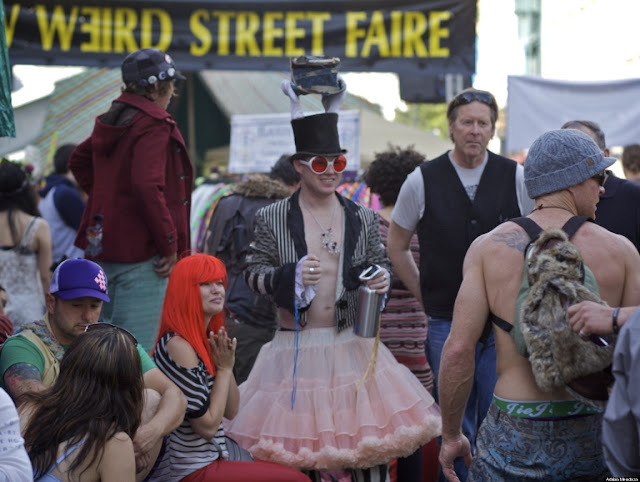 The How Weird Street Faire claims to be the longest-running electronic music street festival in North America, showcasing diverse forms of dance music including live electronica, downtempo, breaks, electro, trance, house, techno, dubstep, drum & bass, dub, and world beat. As of 2017, it had several thousand visitors. The How Weird Street Faire attracts thousands of people in colorful costumes, featuring a different theme each year. The 10th annual event was held on May 10, 2009, with the theme of "Rebooting the Motherboard". The 11th annual event was held on May 9, 2010, with the theme of "Bollyweird: The Cosmic Dance". The 12th annual event took place on May 1, 2011, with the theme of "Mythical Realms". The 13th annual How Weird Street Faire took place on May 13, 2012, with the theme of "2012: The 13 moons we’ve been waiting for". The 14th annual event was held on April 28, 2013, with the theme of "Weirdi Gras: A Carnival of Peace". The 15th faire was held on May 4, 2014, with the theme of "How Weird in Outer Space. Peace - the final frontier". The 16th event took place on April 26, 2015, with the theme of "The Weirdest Show on Earth". The 17th event took place on May 1, 2016 with a theme of "Cosmic Stew". The 18th annual event took place on May 7, 2017 with a theme of "Summer of Weird".